Zero turning radius riding lawnmowers are all the rage with homeowners who have a large lawn, as well as commercial lawn maintenance companies. With these mowers you want the power, maneuverability, and size to be able to chew up large areas of lawn in a small amount of time. A little comfort in the seating and controls is also a major bonus. The Troy Bilt Mustang XP-50 has a very powerful 724cc Briggs & Stratton engine along with a high transmission power to provide a significant amount of torque. The amount of power it puts out is nice when you consider that it also manages to be somewhat fuel efficient. This is thanks in large part to the OHV or Overhead Valve design of the 724cc engine. It also has EZT dual hydrostatic transmission. The full pressure lubrication system is also a nice feature. This ensures that so long as a sufficient amount of lube is actually in the system that the moving parts will operate smoothly. While this might seem someone on the nose, it’s worth bearing in mind that not all mowers come with this feature. Lap bar seating is debatable as a pro or a con. Some people love it, and some people would rather have controls that offer a little more customization. It has the power you want to get around the lawn efficiently and effectively. One knock though is the size of the front casters. True they are big enough to handle riding around on a perfectly clean lawn with firm soil. They can even handle the occasional big bump or two. Yet there are other times when they can be an issue. If you have particularly sandy soil or the soil of your turf has gotten soft from frequent rain, it is possible for the casters to dig in and even get stuck. While it’s rare, it can be a massive headache if you are cutting at the bottom of a slope. Something like a big stick hiding in the tall grass could also be an issue for the small casters. Make sure you do a thorough job inspecting the lawn for debris like this before you mow. If you are a fan of lap bar controls the Troy Bilt Mustang XP 50 is very easy to use. There’s no real armrest, which depending on how you are personally built could be a little bit of a comfort issue over the course of a long mowing session. Troy-Bilt claims to have put a significant amount of time into the design, construction, and testing of the Mustang XP 50 Zero Turn Lawn Mower. When you take a closer look at it, you see these claims are backed up in a lot of the major areas where you would expect to see the extra signs of quality. You also see them in the little things. Take for example the highly durable, long-life belts, which are powered by high-quality metal belt pulleys instead of cheap plastic ones that tend to breakdown. The highly durable frame, heavy-duty components, and the durable wheels also reflect a passion for quality. 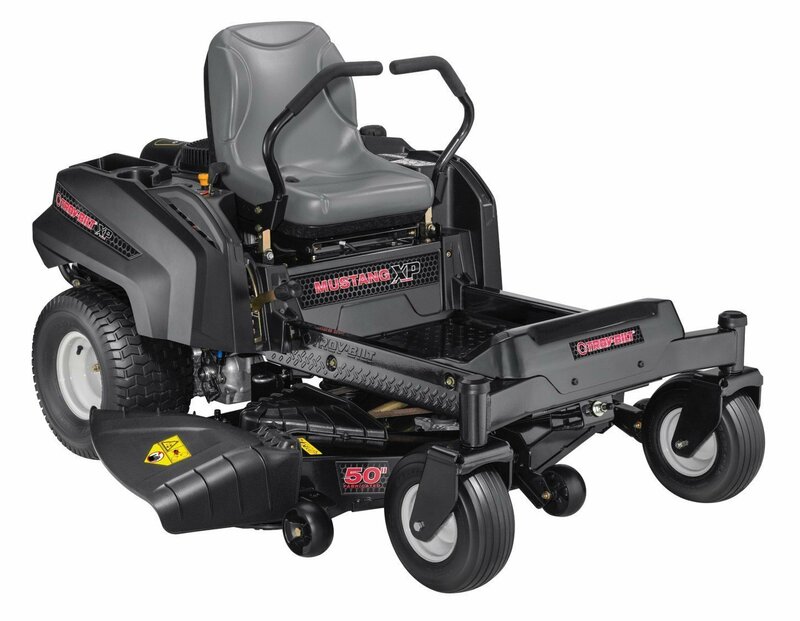 The 50” cutting deck is bigger than you will get with a push mower, and it’s surely enough to handle an average big suburban lawn. Still, a lot of other zero turning radius riding lawnmowers in this same price range have a 60” deck. If you are operating a professional lawn care service, it might end up finding yourself with deck envy later on down the line. Adjusting the height of the deck is also a little bit awkward. It’s not a detracting feature, it would just be nice if it was a smoother change. As you would expect a riding lawnmower, needs the usual oil changes and filter replacements. You can tell that a lot of thought was put into the belts, belt materials, and pulley wheels. While they rarely need to be replaced, you should give them a good looking over at the start and end of each season. Tire pressure can sometimes be an issue, so keep a pressure gauge in the garage or the shed next to the mower. The last thing you want is to pop a bead on a tire seal in the middle of the lawn because the tire was low on air when you left the garage! The Troy Bilt Mustang XP 50 Zero Turn Lawn Mower has the usual seat pressure safety device that you expect on all riding lawnmowers. 724 cc Briggs and Stratton engine with overhead valves for maximum power and fuel efficiency. The EZT technologies makes for reliable operation, as well as smooth maneuverability. The full pressure lubrication system also helps with maintenance and part life. The overhead valve configuration of the 724cc Briggs and Stratton engine helps the Troy Bilt Mustang XP 50 deliver a significant amount of power, while also being relatively fuel efficient. 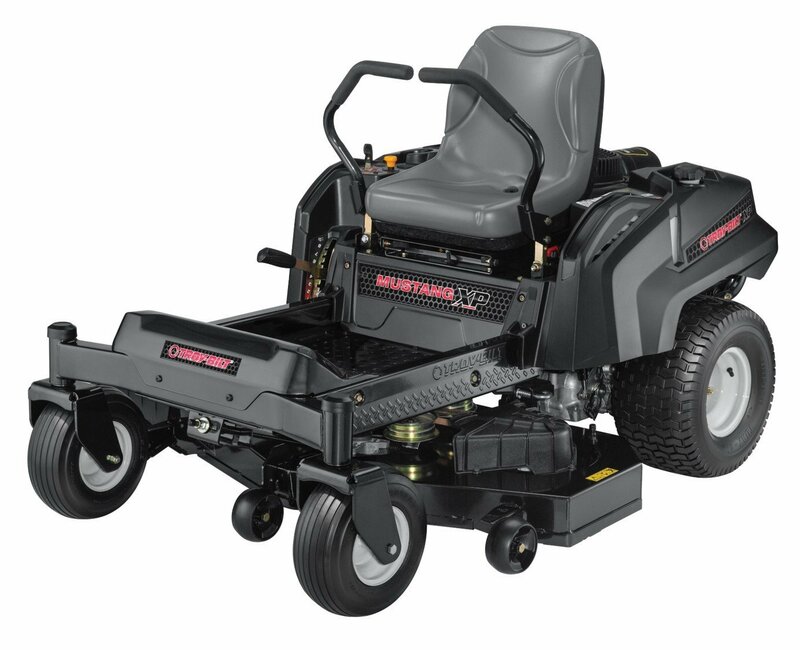 The 50” mower deck is a little bit on the small side for a mower in this class, meaning that by the end of a long mowing session, you will likely end up making three or four more passes than you would with a mower that has a 60” deck.